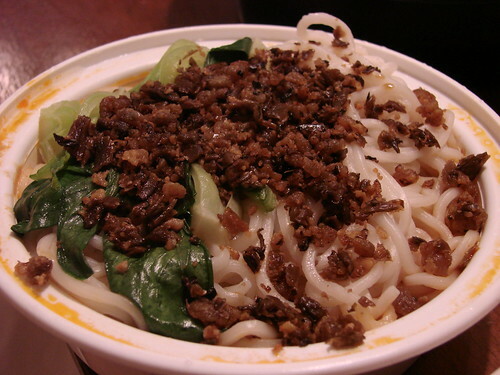 I had initially read about Lan Sheng when Joe DiStefano wrote it up on Serious Eats back in October. Anything Sichuan that gets Joe's blessing is worth a look in my book. Perusing their takeout menu online I discovered that Lan Sheng has a pretty substantial lunch special menu. At $6.95 for your choice of entree with Hot & Sour, Wonton, Egg Drop Soup or a spring roll plus fried, brown or white rice, they are cheaper than their midtown Sichuan competitors--Wu Liang Ye's lunch specials are $7.95 for a more limited selection and include a spring roll and your choice of rice. Szechuan Gourmet has only slightly less selection (40 lunch options to Lan Sheng's 43) which come with soup and steamed rice but the prices range from $7.40 to $9.50. Though I ultimately chose to go with Lan Sheng's Dan Dan Noodles ($5.50) my first time out, after seeing the massive eat in lunch servings, I'll definitely consider coming back to order off of the regular lunch menu. As for the Dan Dan, it was delicious. 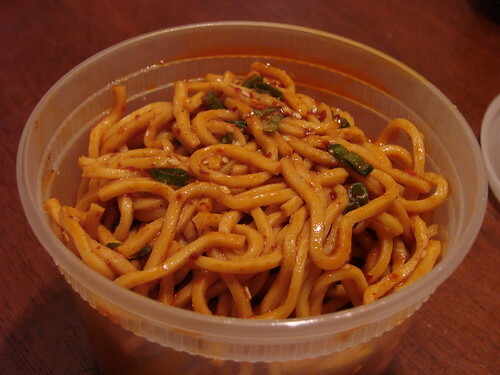 Take out noodles are always a little risky--they are never going to be quite as good as fresh out. While they didn't have that slight chewiness you might get if you ate them in person at the restaurant, the flavor was all there and they were very generous with the chili pork topping--probably more generous than any of the other Sichuan places I've been thus far. My one recommendation if you get this dish takeout is to have a plate at the ready for noodle mixage. The topping on the noodles below is just the beginning there's some garlicky, oily goodness on the bottom of the container that you'll want to mix in. The heat is mostly concentrated in the porky chili mix on top, so when you mix the noodles it will tone the spice down slightly. Still this dish has some nice head and overall it was super flavorful. So delicious in fact that after a late night in the office later in the week I went back and got some more Dan Dan takeout to bring home to Lawman along with an order of their Tofu with Chinese Broccoli and Chengdu Wontons with Sichuan Peppercorn Vinaigrette. Since we cleared the $20 dinner time takeout minimum we got our choice of the complimentary appetizer and choose the Szechuan Cold Noodles. All in all dinner was delicious and more than ample. We polished off the Dan Dan, wontons and 1/2 of the tofu with broccoli and didn't even have room to try the spicy noodles. A couple notes on ordering. While the takeout menus say "Complimentary Appetizers with minimum $20 choice of Szechuan Cold Noodle, Wonton in Hot Sesame Oil and Pickled Vegetable. Dinner time take out only" in my experience you have to be the one that reminds them of this promotion and ask that the complimentary appetizer be included. Note two: for some reason I had a hard time getting the guy on the phone to take my order for #170 which is supposed to be Tofu with Chinese Broccoli. When he read it back to me he said Tofu with Broccoli to which I responded, Chinese Broccoli, to which he responded American Broccoli to which I responded, can I get it with Chinese Broccoli? 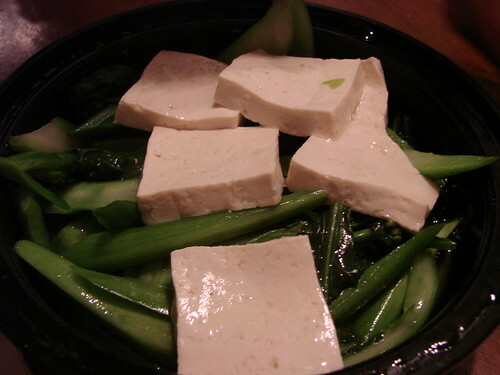 After much back and forth he explained that he had to charge me an extra $1 to get tofu with Chinese Broccoli. I suppose I could have argued it because it's on the menu at a certain price, but honestly it was almost 10:00pm and I just wanted to get my order in and get home. Next time, I order that dish--and there will be a next time, it was flavorful and fresh without being overcooked or salty--I will make sure I'm charged the right price. 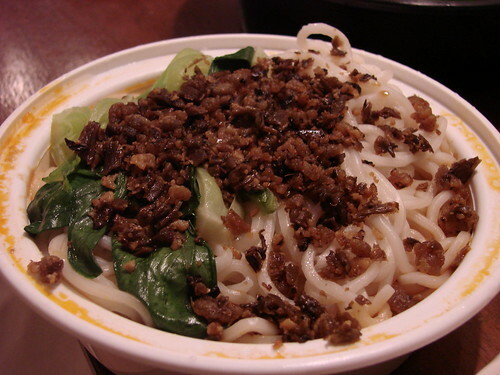 As for the Szechuan Cold Noodles, I ate these for lunch the next day and they were fiery and filling. 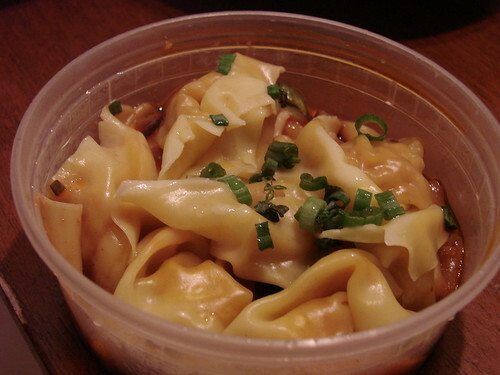 There's a lot of tongue numbing heat in the chili oil at the bottom of these so you might want to mix to incorporate. Anything that's spicy enough to make my tongue tingly and numb is a winner in my book. Postscript: while I was doing a little post visit Lan Sheng research, I came across Sarah DiGregorio's recent piece on the restaurant on the Village Voice. It seems that the people at Justice Will Be Served are alleging that Lan Sheng is involved in the Wu Liang Ye labor dispute--saying that the closed branches of Wu Liang Ye illegally transferred their operations to other restaurants among them, Lan Sheng. If you've been following this issue I highly recommend you reading Sarah DiGregorio's piece. I haven't been able to find any additional information substantiating these claims or the Wu Liang Ye case in general on Justice Will Be Served's website, or elsewhere online so it's hard to know what the real story is. Based the information currently available, at this point I'm inclined to agree with Sarah DiGregorio in giving Lan Sheng the benefit of the doubt. Glad you liked the joint. With regard to your postscript I too am inclined to agree with Sarah especially since I'm sort of acquainted with the owner who seems like a stand-up guy. This Weekend Practice Random Acts of Pieness! So That's What Flagels Are For! Chinese BBQ on a Hot Dog-Brillant! Back to Work! and Financier.